This entry was posted on Tuesday, January 29th, 2019 at 12:25 pm. 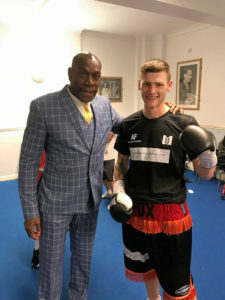 WESTBURY boxer, Anthony Fox, is planning to make 2019 his most successful year yet, and needs help from local sponsors. After boxing for six years, Anthony turned professional in May 2016. Last year, he won a fight against the former Commonwealth and WBC international champion, Luke Blackledge. The fight was featured live on Sky Sports and Anthony’s ranking increased, and he is now in the top 20 boxers of his weight class in the UK. To go further in his career, Anthony is searching for sponsors to help with fees such as licence fees and medical tests. It is a requirement by the British Boxing Board of Control to pass medical tests annually. They are not covered by the NHS and can cost around £1,000. Anthony said, “Last year I was fortunate to have a few people sponsor me, which really helped with the fees. However, I am looking for more help this year. “As well as helping me out, sponsorship can also benefit businesses. They will have their logo on my fight kit and have plenty of mentions on my social media, which is great advertisement for them. It is also worth knowing that sponsorship is 100% tax deductible. “I’m hoping now to fight for a recognised title, which could be around March time. Training is going great! I carried on training hard over the Christmas period as I know 2019 is going to be a big year for me. For more information about the sponsorship packages that Anthony has on offer please email: afox0412@gmail.com or call 07526 763715.